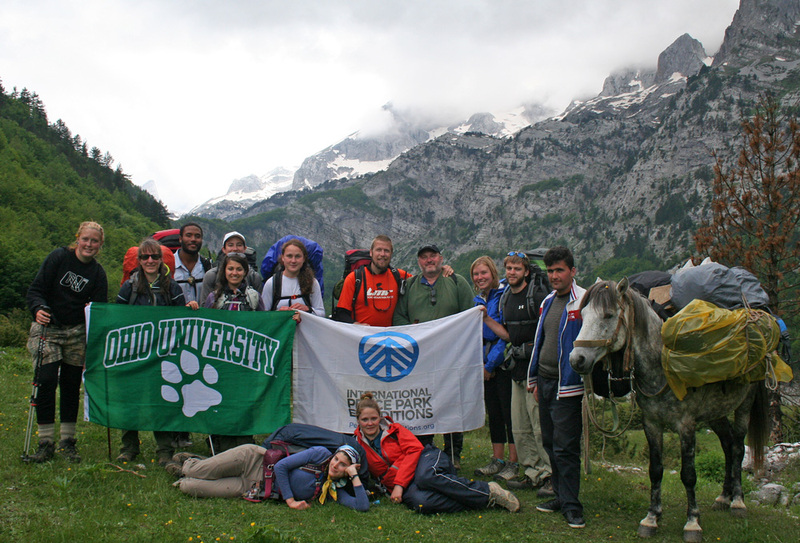 Under the leadership of International Peace Park Expeditions Director Todd Walters and Ohio University Professor Geoff Dabelko, a small group of students trek through this prospective Balkans peace park each summer in May to learn about the potential for conservation and eco-tourism to not only provide wealth and alternative livelihoods but also encourage cooperation between former adversaries. The yearly expedition is part of a for-credit course through Ohio University’s Environmental Studies Program at the Voinovich School of Leadership and Public Affairs. Prokletije National Park in Montenegro began as a “paper park” in 2009 – a protected area by legislation but not in practice. The park gained legitimacy in 2012 when Enes Dresković was appointed its first director. At 6-foot-10, Dresković can be intimidating as he patrols the park day and night on a motorcycle. But as the park’s sole employee for the first two years, he has had to be. It was up to him and just five volunteers to protect the entire 41,100-acre area until three rangers were hired this past year. “Illegal logging is the biggest threat,” Dresković told us. The industry has roots in organized crime and illicit support from officials at the state and local levels, he said. What’s more, it impacts more than just the environment. Illegally harvested timber brings in less money to local government than legally harvested timber because the loggers evade taxes. This dynamic reduces money flowing into public budgets and the formal economy while encouraging corruption. According to the Regional Environmental Center, an NGO based in Hungary, more than half the conifers illegally logged in Montenegro in 2007 were from the municipality of Plav, a center of mafia activity near Prokletije National Park’s borders. Loggers have diversified their tactics as the park becomes more legitimate, said Dresković, adapting to new monitoring and enforcement efforts. A daily newspaper in Montenegro recently highlighted the involvement of a high-ranking Democratic Party of Socialists (DPS) in the industry, for example. “Every logger with documents between 2011 and 2013 had legal permits to cut conifer forests located within the borders of National Park Prokletije, to which they have no right,” Dresković explained in the article. Every permit was approved and signed by the same DPS official. “There is reasonable suspicion that these documents were false because certain permits were entitled to individuals who are deceased,” Dresković said. Encouraging people to use and care about the park is a major focus as well. The park recently reached a significant milestone when the Austrian Development Agency and the National Parks of Montenegro co-financed the construction and outfitting of a visitor’s center on land donated by the municipality of Gusijne. The park is also working hard to attract young volunteers, a critical step toward addressing the intergenerational communication and technology gap in the surrounding communities. “There still exists a clear lack of information in the eyes of the local population of how they can benefit from the national park,” Dresković said. Hiking northeast through the mountains, we came across the first evidence of the conflict that shook this part of the world only a decade and half ago. Zulfikar “Zuko” Kurtagic, our Montenegrin mountain guide, stopped in his tracks as our small group approached the crest of the Hajla Mountain Pass. Several students, unaware they had reached the border between Montenegro and Kosovo, had already crested the hill and walked 50 meters into one of the world’s newest countries. As we stood gazing over the burnt aftermath of a wildfire to our left and the breathtaking view of the rolling mountain range before us, we were surprised by the quiet unmarked border. From 1998 to 1999, the trees and rocky outcroppings of this pass served as cover for snipers during the conflict between the Kosovo Liberation Army, comprised of ethnic Albanians, and the Federal Republic of Yugoslavia, primarily ethnic Serbians. A family was killed on the very trail we traveled as they tried to escape the Serbian attacks. We later beat a hasty retreat from a lightning storm down along a KLA weapons re-supply trail. Today the area is home to the Bjeshkët e Nemuna National Park which, like its Montenegrin twin Prokletije, faces a battle for legitimacy. To become a member of NATO and the European Union, countries must set aside at least 10 percent of their land for conservation and protection. The government of Kosovo has set aside Bjeshkët e Nemuna with this in mind. However, the economy is the top political priority, making funding for park management, law enforcement, and educational and recreational opportunities nearly non-existent. Without state support, residents, local government, and NGOs are left to carry on the effort themselves. This neglected “paper park” designation has generated distrust of the national government and opposition to the park itself from some. But Prokletije’s Dresković has found partners in environmental defense here. Fatos Lajci lost a brother in the fighting for Kosovo’s independence, but today he is the executive director of Environmentally Responsible Action Group (ERA), an NGO based in Peja dedicated to improving environmental protection and sustainable development in Bjeshkët e Nemuna. ERA establishes and supports educational programs for local youth, hunting and forestry associations, reforestation projects, ecotourism, and efforts to preserve traditional culture. They are currently involved in a multi-country project to identify and monitor the status of the endangered Balkan Lynx with hopes it will help raise awareness of the region’s biodiversity and threats to it. Our group delivered and helped install two digital wildlife camera traps to assist with the project, and this year ERA captured the first photographic proof that the Balkan Lynx lives in Bjeshket e Nemuna. This international effort provides an environmental pathway for ongoing dialogue and collaboration on an issue of common ground among citizens of different countries with different religions, different ethnicities, and different languages. 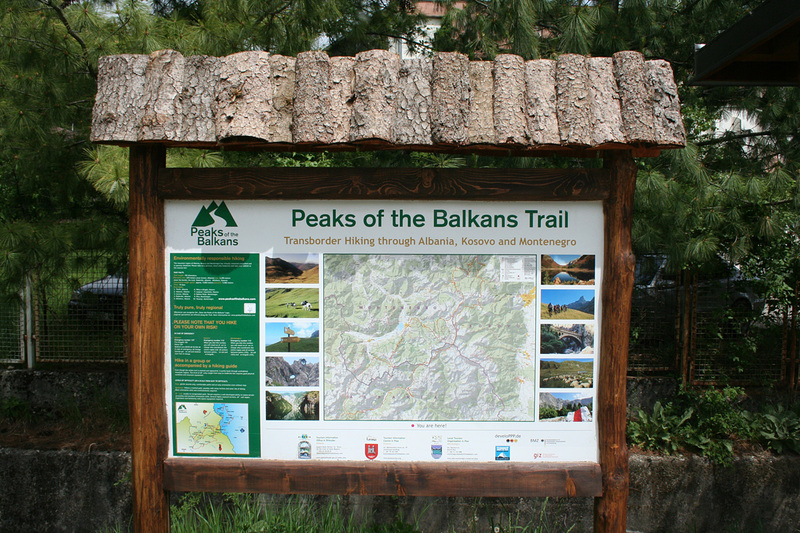 The Peaks of the Balkans and the Balkans Peace Park Project are also working to promote a trans-national hiking trail that winds through Kosovo, Montenegro, and Albania. Private groups supporting conservation, including ERA, have installed signs and informational kiosks in the protected areas of all three countries. In spite of a letter of good intent circulated between the three countries affirming hikers can cross unguarded borders on the trail, the procedures for remote border crossing remain cumbersome. The best practices proposed in the letter are rarely followed and were seemingly unknown to the border guards we met in Kosovo. Despite these efforts, Bjeshkët e Nemuna Park is not welcome by everyone. 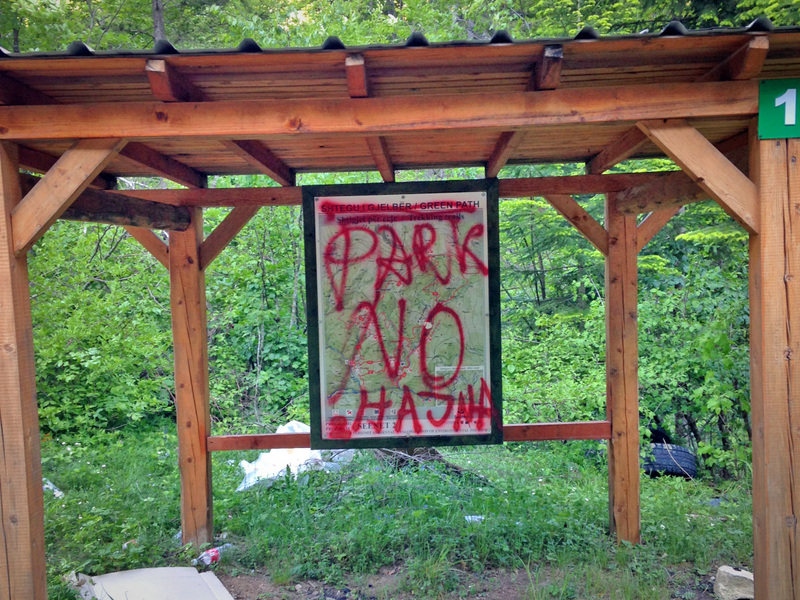 Ripped up trail markers and anti-park graffiti on maps and kiosks are not uncommon. Rights for land owners was a new and confusing issue when the park was first established, and loggers have spread rumors about the government trying to take over private land. Poaching and illegal logging is lucrative and continues, though it has been dramatically reduced through stricter monitoring of the single-lane access road which provides access to Rugova Gorge at the heart of the park. Zeqir Veselaj, former advisor to the Kosovo Ministry of the Environment at the Kosovo Environmental Protection Agency, said calling the park a conservation area does not mean certain areas cannot be legally logged. The Ministry of the Environment, he said, “is not doing enough to inform people about the benefits of the park,” though this is beginning to change as ERA and other advocates help inform local governments and people about the multiple use zones within the park. 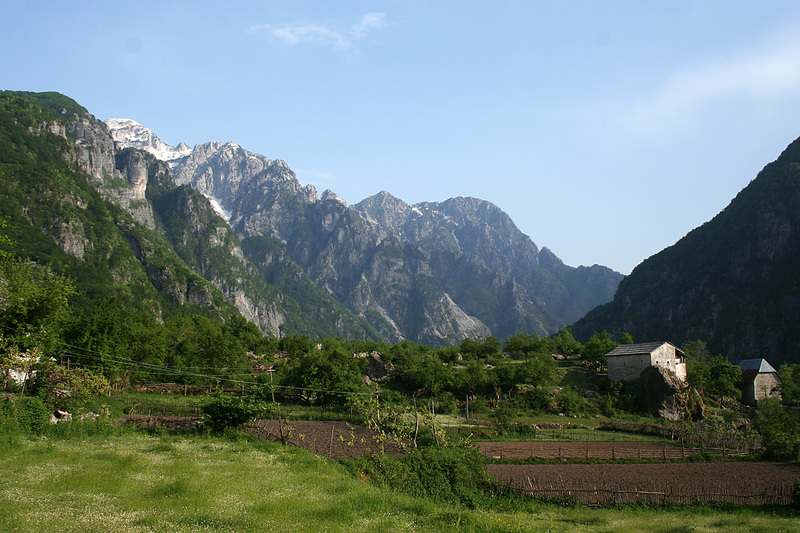 Turning southwest we trekked into the “Accursed Mountains,” as the Prokletije Mountains are known in Albania. Thethi, the name of a small village and national park in the northern mountains, is fortunate to have aesthetic beauty rather than exhaustible resources, which would tempt exploitation, said eco-tourism operator Pavlin Polia who lives in the area. With the help of GIZ, the German Federal Enterprise for International Cooperation, many Albanians are opening their homes to travelers in an effort to promote tourism in a country that was closed to most outsiders during 50 years of communist dictatorship under Enver Hoxha. Ecotourism has created a wide range of economic opportunities for families in the village, supporting local farmers, tradesmen, and drivers through requested goods and services. The income has created hope for a stable economy and healthy environment. “Hospitality is in our blood,” Polia said, whose guesthouse, Polia Shelter Theth, and guiding business is increasingly coordinating with park and tourism officials across the border in Montenegro. But as tourism increases, others have tried to expand the industry in ways that conflict with Polia’s smaller, sustainability-focused, local charachter vision. Between 2012 and 2014, a three-story red brick hotel was built among the traditional limestone rock structures nestled in the valley. The incongruence in architecture is clear. Aside from diminishing Thethi’s cultural presentation and historic atmosphere, new construction for other large hotels is underway on park land with no permits, and no permitting process. Government presence is minimal and enforcement rarer still. New roads are also under construction to ease access to the region. The race for development is part of the country’s push for European Union membership. Like Kosovo, the government has focused on showcasing Albania’s preserved landscapes to draw foreign interest and facilitate joining the European Union. Indeed, in June 2014 the European Union granted Albania candidacy status, the next step on the way to becoming a full member. Arjeta Troshani, the dean of economic faculty at Shkodra University and a consultant to the national government on tourism, stressed the importance of marketing Albanian culture while working to secure resource management plans with neighboring countries, including environmental partnerships with Montenegro and Kosovo that could make a tri-country peace park possible. But in order to preserve the culture of Thethi and other small villages, it is clear more open discussion between stakeholders is needed. “[Albania] is too small to see on a map, but inside…it is so huge,” said Polia. Comprehensive planning that takes into account the impact of development on the landscape, the culture, and the people is sorely lacking. A critical dynamic that will determine the success of this transition from isolated subsistence to interconnected development across the Balkans is how effectively laws protecting Thethi, Bjeshket e Nemuna, and Prokletije are enforced. This single alpine ecosystem spans three new democracies and is crucial for European Union membership in all three countries, providing an important barometer for cross-border cooperation. Cross-cultural exchanges contribute towards establishing the cooperative frameworks needed to achieve these goals. And, as grassroots activism and action integrate with top down policies, we hope there will one day be formal recognition of a Balkans Peace Park. Perhaps expeditions like ours will play a small part in facilitating the cross-border cooperation that expands sustainable development, environmental conservation, and reconciliation. Jenna Cripps, Stephanie Gentle, Sarah Liuba, Alaina Morman, Matt Paulins, Alexandra Sargent, Rachel Schack, Nora Sullivan, and Laura Tobar were students on the 2014 Balkans Peace Park Expedition. At the time, Stephanie Gentle and Sarah Liuba were graduate students at the Monterey Institute of International Studies, Alexandra Sargent a graduate student at the University of New Hampshire, and Jenna Cripps, Alaina Morman, Matt Paulins, Rachel Schack, Nora Sullivan, and Laura Tobar were students at Ohio University. Todd Walters is the founder and executive director of International Peace Park Expeditions. Geoff Dabelko is a senior advisor to ECSP and professor and director of the Environmental Studies Program at Ohio University’s Voinovich School of Leadership and Public Affairs. Photo Credit: Todd Walters, Geoff Dabelko, and Gracie Keyes. Video: Stephanie Gentle and Pedaling Pictures. enough bottom up. I did not receive much enthusiasm and have wondered to this day what I did wrong. My conclusion was that American’s approach these type of projects with a level of arrogance and condescension that tends to alienate our potential friends. We did it with Big Bend NP and Mexico, and we have numerous other examples were we tend to tell people what to do, but don’t lead by our own examples. Bosnia-Hercegovina went on to get World Bank funding to look at their political conservation institutions and infrastructure to support protected areas, and used a model for protected areas that was inclusive of people rather than exclusive. I wrote a small paper on this effort called the Modernization of Multiple Use (published by the George Wright Society), but my model is not embraced by the purists park/protected area ideologues. The North American National Park model worked for us in places 100 years ago, but it doesn’t always work for other cultures and environments. It may not work in the Anthropocene either. I was warned in the literature by Adrian Phillips and Saleem Ali, but I didn’t heed their message in my Bosnian work almost 10 years ago. Right now with the current political debate in this country, half of the political parties believe that we can still go to war to make peace, and negotiations are not as effective as drones. Good luck on your project, and on ward through the fog. Thx Geoff for your comment. Indeed, these kinds of efforts require humility and a process that is owned and driven by the parties on the ground. External partners can assist but last change requires local buy in. We do a lot of listening on these trips and try to share experiences from other parts of the world when hey are sought. The energy and commitment (and often bravery and forgiveness) of the parties involved always proves inspiring, making us try to find ways to assist.